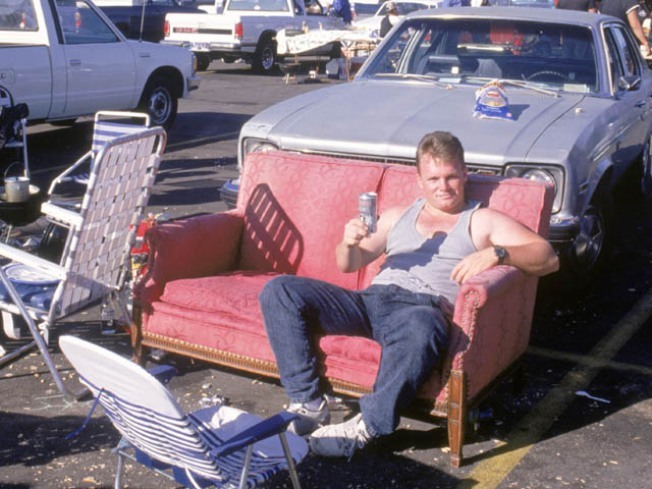 In this 1989 photo, a tailgater enjoys a brew in a parking lot. It was a simpler time. No tailgating after kickoff means no tailgaiting after kickoff. Violators strictly enforced -- with police officers turning off grills, if necessary. Revelers at Candlestick Park on Sunday were greeted with a warm dose of reality to go with burgers, chicken and whatever fixings they'd had planned for a postgame meal -- as in, no postgame meal at all, as San Francisco Police Department officers enforced the new rules put in place at the 'Stick following last month's violent Raiders-49ers preseason matchup. All tailgates had to be shut down 15 minutes before kickoff, with cops personally extinguishing the flames of die-hard grillers still munching brats by 1 p.m. on Sunday, according to the San Francisco Examiner. And tailgating post-game -- a tradition and a necessary sobering-up maneuver for many a football fan -- was also strictly prohibited, with team staff as well as police making sure parking lots were clear of grilled meats following the 49ers' win over the Seattle Seahawks. This meant many football fans' food and efforts went straight to the garbage can. Or the seagulls, whomever struck first. But not Sunday. And not never again. Safety first -- chicken when you get home.